Jodi went into labor a bit earlier than she had expected—and the baby was coming rapidly. Given their location and other factors, the midwife they had hoped would deliver the baby at their home encouraged them to get in an ambulance and head to the hospital. Their baby, whom I will call “Annie,” was born in the ambulance in the parking lot of the Hershey Medical Center—a state-affiliated hospital in Pennsylvania. Hospital personnel arrived very quickly and took charge of both baby and mom. Eventually, a risk management staffer admitted that the risk that was being managed was not the health of Annie but the risk that the hospital might get sued if something went wrong after she was discharged. Ultimately, risk management said that they would be satisfied with a 24-hour stay and that Jodi and Scott could remain with the baby overnight. Late in the afternoon, a government social worker named Angelica Lopez-Heagy came into Jodi’s room announcing that she was there to conduct an investigation. Jodi asked to know the allegations. The social worker claimed that it would be against the law for her to show Jodi the allegations. Fearing that the social worker would carry out her threat, Jodi replied that she was willing to cooperate. The social worker soon intimated that the issue was Jodi’s refusal to consent to medical treatment for the baby. Jodi replied that she had no idea why anyone would say that. The social worker claimed that she had refused to allow a Vitamin K shot for Annie. Jodi replied that no one had asked her about such a shot. Moreover, she had overheard hospital staffers saying that they had already given Annie such a shot. Neither the social worker nor any hospital staffer ever gave Jodi or Scott any example of any medically necessary treatment that they had refused for Annie. At this point, Scott left the hospital to tend to their older children who were staying with friends. Shortly after this, the hospital asked to check Annie’s white blood cell count and to perform a strep test. Jodi agreed to the testing. Then the hospital demanded that they give Annie shot for Hepatitis B. Jodi said that she would agree only if they tested her or Annie to see if either of them were positive. If so, then she was quite willing to have the shot for Annie. The hospital claimed that they had forgotten about this earlier when it was still possible to test that day, and that they needed to give the shot anyway without any testing. When the social worker pressed her to make an immediate decision about this shot, Jodi asked her if they could simply wait until Scott got back before they decided. Put yourself in Jodi’s shoes at this moment. You gave birth that morning in an ambulance. The hospital has made wild and conflicting claims about your baby’s health all day long. You are exhausted. You are in pain. Your husband has gone to check on your children. And a social worker who has threatened to take your baby into police custody is standing in your hospital room demanding that you make an immediate decision. The social worker renewed her threat. If Jodi would not answer her question right then, she would call the police. And then the social worker started adding conditions. She and Scott would have to agree to sign a safety plan before she could conclude her investigation. Jodi said that she wanted her husband and an attorney to look at the plan. She felt she was in no position to read such a document and really understand what she was being pressured to sign. And then the story turns ugly. The social worker left the room and called the police. Without a court order they took custody of Annie, immediately claiming that she was suffering from illness or injury—a patently false claim. The social worker consented to the administration of the Hepatitis B shot even though no blood test had been done. Scott met her at the entrance to the hospital. The police escorted them both off of the grounds of the hospital. Jodi was told that she would be allowed to return every three hours to nurse the baby through the night. Jodi and Scott were forced to spend the night that she had given birth in their car in a nearby parking lot. You read that right. They kicked this mother out of the hospital, and in order to be close enough to feed her child, she had to sleep in the car. To add insult to injury, Jodi was given access to Annie only sporadically and not every three hours. The next morning a judicial officer held a shelter care hearing. After hearing the evidence, the officer immediately returned custody of Annie to her parents. No parents should be put through this kind of ordeal. It is not a crime to ask questions about the well-being of your child. It is not a crime to ask for testing to ensure that a procedure is needed before it is done. It is not a crime to be a protective mom. It is a moral offense of the highest order to kick a mother out of a hospital and to seize her child on the day of her birth simply because a mom wanted to have her husband read a legal document before she signed. Both the medical personnel and the social worker engaged in outrageous behavior toward this family. And we believe that they violated their rights under the Constitution of the United States. And we are going to court to prove it. Why is HSLDA fighting for parental rights in this context? It is not a homeschooling case. We are taking this case because we are tired of seeing the erosion of parental rights in virtually every area of life. Parental rights in medical cases have an impact on broader parental rights, including educational decisions. And the plain fact is this: If we don’t fight for parental rights, it is probable that our rights will be eroded bit by bit until there is nothing that remains. We cannot afford to fund cases like this out of HSLDA’s membership dues. We are taking this case because we believe that our members and friends will stand with Jodi and Scott Ferris. We believe that parents should not be punished by “over-the-top” social workers and doctors. The social worker’s priority was not the welfare of Annie, but her own convenience and her own perception of her power. She was aiming to teach this homeschooling mother a lesson. And the hospital was clearly not concerned that Annie had a medical issue—they were just trying to avoid being sued for medical malpractice. When government workers run over parents in cases like this, the lesson that needs to be taught is to the government. This case will cost tens of thousands of dollars. 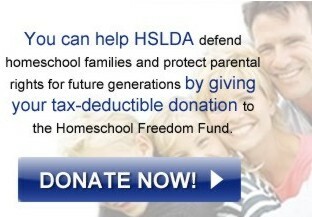 Your tax-deductible gifts to the Homeschool Freedom Fund of the Home School Foundation will make it possible for us to take this case to court and to try to establish a precedent that will help protect us all. All of our families are at risk when the government is allowed to run over one of us. When we stand together, we can fight back for freedom and for truth. Thanks for giving as the Lord leads you. And pray for us. This is not an easy case. We really need your ongoing prayers.